~In the “What else is new” category, the Packers apparently have lost another key player for the year before the regular season even arrived. BJ Raji leaves the game against Indianapolis back in Oct 7, 2012, a game in which Cedric Benson’s season and career also ended. Last night, Raji’s bicep popped. 2009 first round pick B.J. Raji suffered a torn bicep last night against the Oakland Raiders. Last year, it was 2010 first round pick Bryan Bulaga who suffered a season-ending ACL injury before the season arrived. Of course, 2011 first round pick Derek Sherrod suffered that devastating, gruesome broken leg his rookie season, and he is still trying to fully make it back from that. Then you have 2012 first round pick Nick Perry, who two years in now has missed about as many games as he’s played, due to an assortment of injuries. And 2012 All-Rookie CB Casey Hayward missed almost the whole season last year with the torn hamstring. 2013 first round pick Datone Jones was hobbled all year long from an injured foot in the opening game vs San Francisco, although he never had to go on season-ending IR like all the others. This year’s first round pick Ha Ha Clinton-Dix better take notice. The Packers were expecting big things from Raji this year. He had hoped to cash in big in the off-season as his rookie contract had expired, but he received little to no interest on the open market, and he and his agent elected to take a one-year “prove-it” deal and the Packers agreed to move him back to NT from DE, with hopes his quickness would allow him to return to being the disruptive guy that he was in 2009 & 2010. 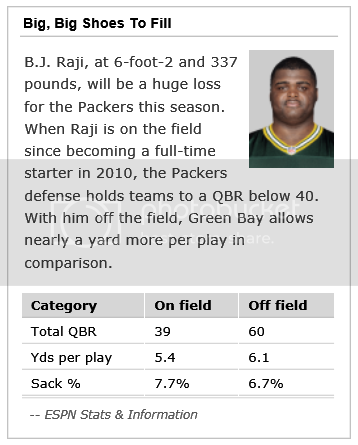 As evidence shows, Raji is a difference-maker, and his loss will be felt. Since it’s so early, it’s good and bad. The good: It’s early enough that no cuts have been made and the Packers can cut accordingly. The bad: It’s so early, the Packers depth will be tested as there surely will be more injuries once the season actually begins. More guys will go down. It would have been nice to at least make it to the regular season week one before losing a key guy for the year. Once again, that’s not the case in Green Bay. It might not be a fatal loss as losing Rodgers, Matthews, or Peppers might be. But it will hurt. Exactly ‘how much’ remains to be seen. GREEN BAY, Wis. — Remember the reception (boos) Greg Jennings got last year when he returned to Lambeau Field? The boos were loud, their intent unmistakable, and Vikings wide receiver Greg Jennings heard them though the former Packer insisted he was unbothered by the cold shoulder fans gave him Sunday at Lambeau Field. “I really wasn’t looking for any kind of reception,” Jennings said after the teams played to a 26-26 tie. Better yet, remember the reception Brett Favre got when he made his first, and second, visit back to Lambeau Field as an opponent? There’s a big difference between the Vikings and, well, anybody else. Even the Bears. ^ That reception for Rodgers, at the end of that clip, gives me chills. There will be the opposite reception tonight when Charles Woodson comes back. The former NFL Defensive Player of the Year for the Packers, Woodson was paramount to the Packers winning Super Bowl XLV. Woodson was the big free agent addition from Ted Thompson and the Packers got his best years of his career. He was let go a year ago in a youth-movement by Thompson, and I believe it’s been proven to have been a mistake. The guys he chose to keep instead were both proven to be failures and were disposed of. MD Jennings in the off-season and Jerron McMillian during the season last year. And now the Packers used a first round pick in Ha Ha Clinton-Dix to fill that massive hole they had. They might not have that hole this year with Sean Richardson looking good and Micah Hyde moved to safety. Yet they still might if they keep putting Morgan Burnett back there as starter. In any event, Woodson was almost like Reggie White for the Packers defense. Very similar, from the back end though and not the front lines. Not to be forgotten is James Jones. I have always felt that he, like AJ Hawk on defense, has been extremely under-appreciated and unheralded by Packer fans. Jones was ripped on by fans early, and down the stretch in 2010 as he had some big drops in big games and big moments. James Jones wanted to remain with the Packers, but they went with youth and didn’t try and keep him, unlike with Greg Jennings. I’m glad Jennings ended up on a bad team and had a rotten losing season last year. I hope Jones and the Raiders turn it around and surprise folks in the AFC West this year. But he solved that and became a very reliable playmaker. His touchdown catches in the playoff games during the Super Bowl run were fantastic, especially in Atlanta when the game was still close. But most of all, he was a great person and a great teammate. He’s a man you’re proud to root for, and if you get to know personally, a man you’re proud to know. And one of those guys who makes you a better person just being around him. He’s kind of what we thought Greg Jennings was, until his greed and selfishness, and ego reared it’s ugly head. I love Davante Adams and Jeff Janis. But I wanted to keep James for sure. I know there will be a huge roar and reception for Woodson. I just ask all fans to remember all the great catches and blocks that James Jones gave the Packers from 2007-2013, and give him a huge round of applause tonight. Packer fans were just announced as being the best fans in the NFL, which comes as no surprise to most. Please show why tonight when Jones is announced. ~With Aaron Rodgers, Eddie Lacy and company playing a quarter, the Packers offense looked in mid-season form as the Packers won at St Louis 21-7 Saturday afternoon. Rodgers toyed with the Rams’ defense, completing 11 of 13 passes for 128 yards in his two series, leading the Packers to a touchdown and a field goal. It should have been a second touchdown instead of a field goal, but a touchdown pass to Jordy Nelson was negated due to a penalty. The Packers had two touchdowns called back because of hands-to-the-face penalties. The Packers also lost an interception due to a penalty. All in all, it was a good first game for the Packers top guys, and it doesn’t appear there were any guys lost to injury. But you never know for sure until the day after. It’s too bad there have to be two more fake games to play before the real season gets here. There’s always a high chance of injury in this sport, and to use up any bullets in games that don’t count is such a shame. The Packers next game is this Friday, against Oakland. It’s the first home game of the preseason for the Packers. Zimbio photo – James Jones was THE consummate Green Bay Packer, and it broke my heart to see him leave. But he ended up in a good place, and it will be nice to see him return to Lambeau Field on Friday. 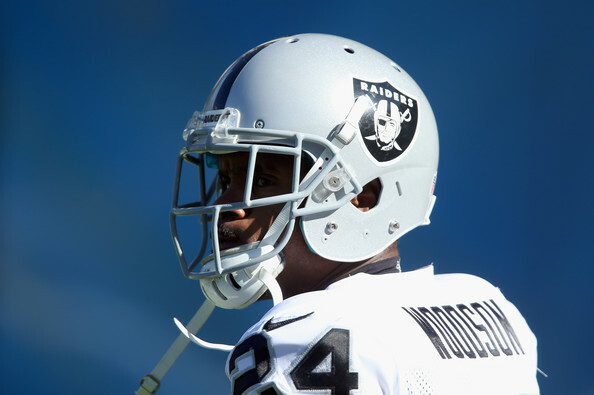 I hope fans give him as big of a rousing welcome as they surely will do for Charles Woodson. Jones was always the most under-appreciated Packer, for sure on offense. AJ Hawk has been on defense. It also is a great chance for Packer fans to come out and welcome back two all-time greats for the Packers in Charles Woodson and James Jones. Gametime is 7:00, and it’s a nationally televised game on CBS so Packer fans everywhere can tune in. Expect the fan reception for Woodson and Jones to be a lot different than when Brett Favre returned in 2009, and Greg Jennings last year. OLB Jayrone Elliott once again was a stud. He dominated the Rams backup LT, registering a hat trick with three sacks. Right after those, fellow rookie OLB Carl Bradford also got to the QB, flushing him out to throw the ball away on third and long. Number three RB DuJuan Harris did what coach McCarthy hates, and that’s cough the ball up. On a nice run, Harris had the ball popped out and gave the ball back to the Rams. I love Harris and did the moment I saw him against Detroit two seasons ago. But Rajion Neal is also legit, if healthy. Harris has to make sure he doesn’t fumble again or he could lose his grip on the third spot at RB. Julius Peppers didn’t play long enough to stuff the stat sheet. But his presence was felt. Going against top-5 pick Greg Robinson, Peppers got the better of the rookie a few times, getting to Bradford and causing a pass to go up for grabs. Those kind of passes often lead to interceptions. In this case, the ball fell harmlessly to the ground. Next time, a Packer defender should be there for a gift interception. The first string run defense was fantastic. The pass coverage not as good. On a long pass to Brian Quick, Sam Shields was beaten to the inside, and Ha Ha Clinton-Dix took a poor angle coming over. It was reminiscent of Mordan Burnett and MD Jennings last year. 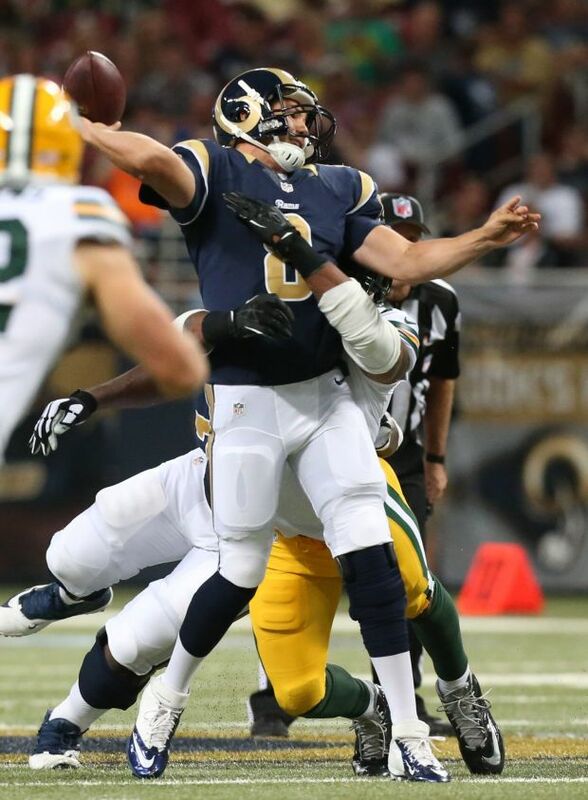 To be fair to HHCD, it was Shields who was beaten and it was a perfect throw from Sam Bradford. The Packers backup OT situation looks very precarious. Derek Sherrod struggled, and he’s the best backup OT left since Don Barclay tore his ACL already. Rookie Jeff Janis came out flying in his NFL debut. He fielded each punt smoothly with no miscues, and he scored a lovely touchdown on a pass from Matt Flynn. Fellow rookie Davante Adams followed that with a two-point conversion. Adams reminds me more and more of Sterling Sharpe than James Jones. Not saying his upside is as good as Sterling, but physically, that’s who I see. I think these are locks for the #4 & #5 WR positions, barring, of course, more injuries. Before practice on Wednesday, general manager Ted Thompson held his weekly news conference but would not discuss Tuesday’s trade of defensive end Jerel Worthy to the New England Patriots. At the time, the trade had not yet been completed because Worthy still needed to pass his physical. Worthy had not practiced at all during camp with the Packers because of a lower back injury, but the trade went through later in the day after the Patriots gave him medical clearance. The Packers will only receive compensation — believed to be a seventh-round pick — if Worthy makes the Patriots’ 53-man roster. For a team that had only 11 interceptions last season, it had to be encouraging to defensive coordinator Dom Capers that his secondary came up with two during Wednesday’s practice. Cornerback Tramon Williams, who had a team-high three interceptions last season, picked off fourth-string quarterback Chase Rettig at the goal line in a red-zone period. 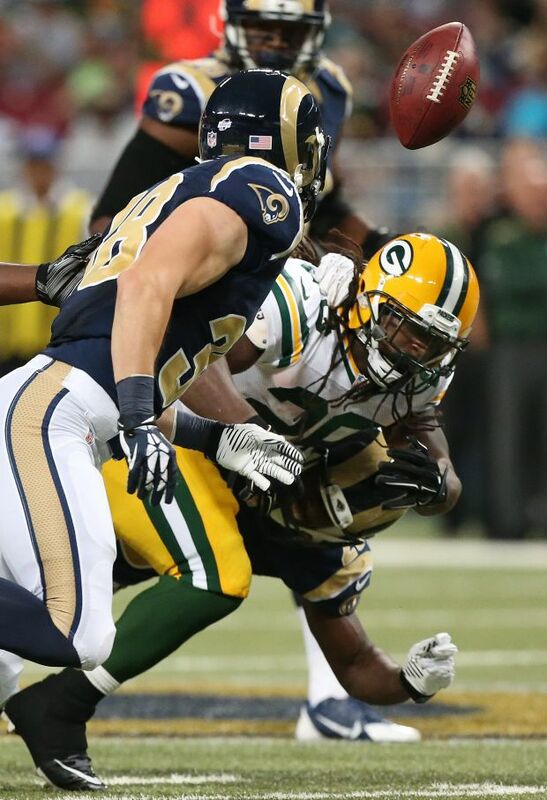 Safety Sean Richardson then picked off Scott Tolzien. It was Richardson’s team-high third interception of camp during 11-on-11 drills. Also, rookie outside linebacker Adrian Hubbard picked off a Tolzien pass while playing on the scout defensive team. Jeff Janis has shown that he’s ready for action. Whether he’s the #5 WR, or #4 WR, he’s made plays consistently. Another day, another remarkable catch by rookie receiver Jeff Janis. This time, the seventh-round pick, who already has a one-handed catch and several other difficult grabs on his camp resume, made a diving catch on a ball slightly overthrown by Tolzien. Coach Mike McCarthy and special teams coach Shawn Slocum don’t appear to be shying away from the idea of using a starter on punt returns. Receiver Randall Cobb, safety Micah Hyde and Williams all caught punts with the first unit. Janis took a few with the scout team. Mason Crosby had missed only two kicks in all of training camp. He missed that many on Wednesday. After converting 34-of-36 to start, Crosby missed wide right from 42 and 53 yards to go 4-for-6, dropping his camp conversion rate to 90.5 percent (38-of-42). Rookie receiver Davante Adams returned to practice after missing two days because of a right wrist injury. The only new injury was linebacker Brad Jones, who sat out after having a dental procedure. 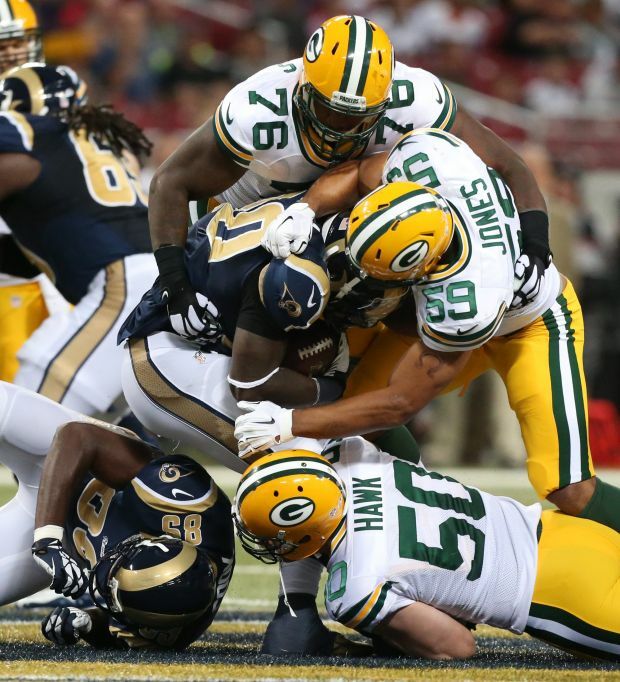 The Packers will not hold another open practice before Saturday’s preseason game at the St. Louis Rams. Players will participate in meetings and walk-through sessions on Thursday. ~The Green Bay Packers have found someone willing to give them something for 2012 2nd round pick Jerel Worthy. The Patriots have traded an undisclosed draft pick for Worthy, most likely a 6th or 7th round pick in next year’s draft, and only if Worthy makes the Patriots final roster. Worthy, out of Michigan State, was expected to give the Packers defense a boost when Ted Thompson moved up in the draft eight spots to select Worthy in the 2nd round. Thompson traded his pick #59 and his 4th rounder to move up 8 spots and take Worthy at #51. Worthy is one of many Packers who have torn ACL’s at the crappy Metrodome. Will Blackmon, Nick Barnett, Mark Tauscher are others I can recall doing so. But he did little during his rookie season, and then in week 17 he tore his ACL at Minnesota. He recovered to play in two games last year, combining to make one tackle. OLB Nick Perry and DT Jerel Worthy were Ted Thompson’s hand-picked top-2 picks in that 2012 Draft to help bolster the Packers defense. Mostly due to injuries, both picks have been failures at this point in time. Perry still has time, but he now is relegated to backup duty as the Packers brought in Julius Peppers. Worthy had no shot of making the Packers current roster. He’s still young at 24, and the Patriots felt he was a low-risk, possible high-reward addition at this point in time. New England visits Green Bay in week 13, so Worthy might make a Lambeau return sooner than later. Will he be in uniform though? Or street clothes? ~Five things we learned from the Green Bay Packers’ 20-16 preseason loss to the Tennessee Titans . . .
Jim Brown / USA TODAY Sports ~Packers quarterback Matt Flynn performed just OK on Saturday night, completing 5 of 10 passes for 49 yards with a 64.2 passer rating. Scott Tolzien (not pictured), however, moved Green Bay’s offense more smoothly and finished with a passer rating of 100.7. The choice to hold Aaron Rodgers out of the game left the Packers’ offense in the hands of Matt Flynn and Scott Tolzien for the first three quarters. Flynn started and was in for five drives, competing for a while against Tennessee’s starting defense. Flynn performed fine, completing 5-of-10 passes for 49 yards with a 64.2 passer rating. In his time on the field, Green Bay scored one touchdown, but Flynn only completed one pass during that series. The Packers’ other four drives with Flynn resulted in 50 total yards and four punts. Tolzien’s first opportunity of the game was in a 2-minute situation before halftime, and he looked quite good, advancing the ball 38 yards before a sack in the closing seconds. To begin the second half, Flynn led Green Bay on a 7-play, 79-yard touchdown drive that was highlighted by two passes to Chris Harper for 55 combined yards. Even Tolzien’s one mistake in that series showed some positive traits. A wet ball (given the heavy rain conditions throughout the game) slipped out of his hands, but Tolzien cleared a defender out of the way to recover it himself. 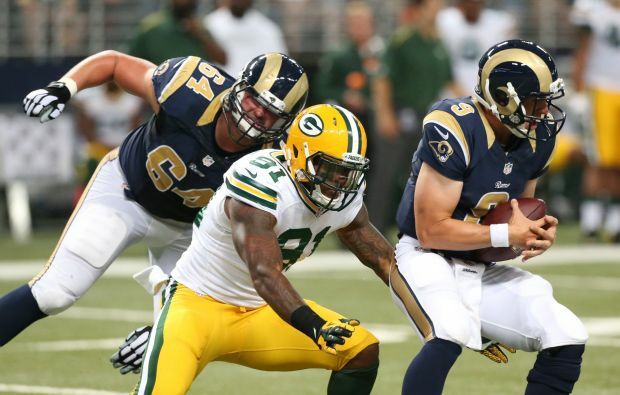 In total, Tolzien’s three drives netted 149 yards for the offense. 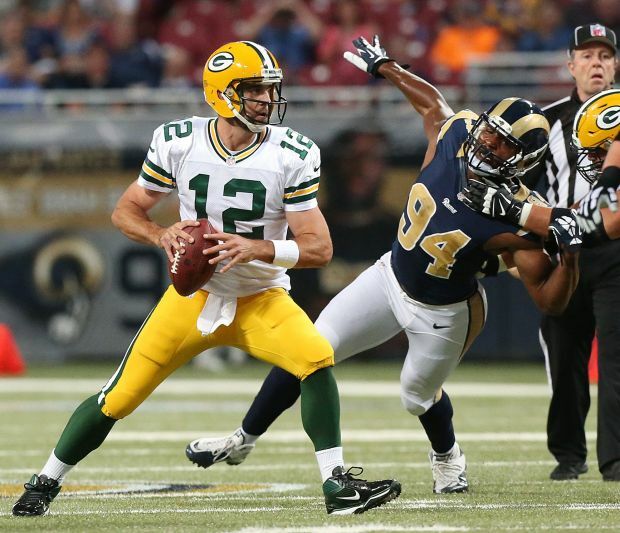 He completed 8 of his 12 throws for 124 yards, giving Tolzien a passer rating of 100.7. It’s very possible that the Packers keep Tolzien and Flynn on the active roster this season. But, while Flynn didn’t do anything to lose the No. 2 quarterback job, Tolzien took Round 1 in an effort to win that spot. Eddie Lacy joined Rodgers (and Jordy Nelson) on the sideline as a healthy scratch from the starting lineup. But in the one and only drive that James Starks was on the field, he dominated the Titans’ starting defense. Starks picked up where he left off in 2013 and ran like he was in midseason form, rushing for 49 yards in six carries and scoring the opening touchdown. Aside from the running back duo of Lacy and Starks (a trio with DuJuan Harris included), a big reason that the Packers could be so good on the ground is because of their offensive line. That was on full display in that series, which was the only one that the five starters all played in. 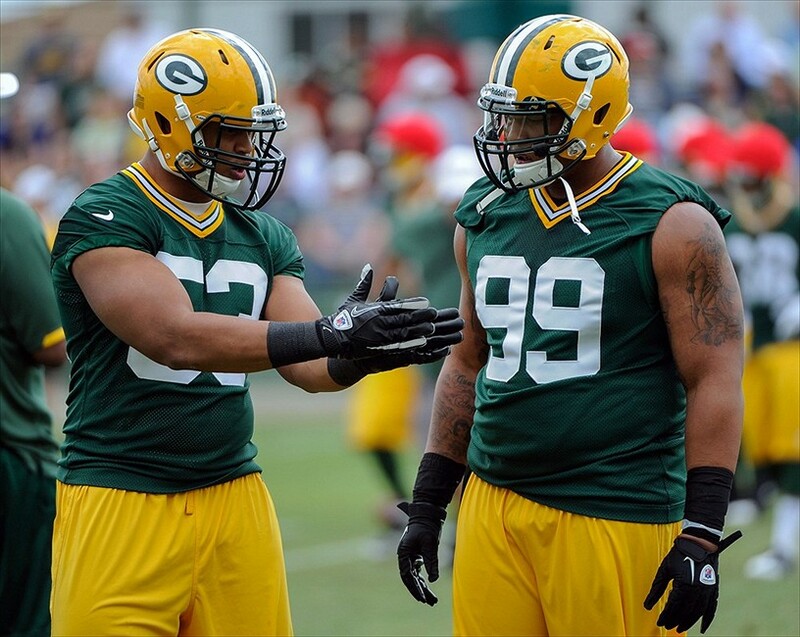 Plus, tight ends Richard Rodgers and Andrew Quarless both had nice blocks for Starks. Photo from Packers.com -DuJuan Harris looked good as a kick returner last night. As if it wasn’t apparent after what Lacy accomplished last season, the days of Green Bay being a relatively one-dimensional offense are over. The oblique strain suffered by Morgan Burnett in practice in the week leading up to this game was the only reason that Ha Ha Clinton-Dix got the first (preseason) start of his career. It came with mixed results for the Packers’ first-round pick. Photo by James Biever, Packers.com – HaHa Clinton-Dix showed some good and bad on his first night. Clinton-Dix’s first chance to make a play didn’t go so well, getting flattened by 5-foot-8, 170-pound running back Dexter McCluster. He rebounded quickly, though, making a nice tackle on the very next play by taking down McCluster after just a one-yard gain. As the game neared halftime, Clinton-Dix showed some good and some bad all in one play. Tight end Taylor Thompson beat Clinton-Dix to get open, but the rookie safety recovered and made a great play by knocking the ball out of his hands. When Burnett returns from injury, Clinton-Dix will likely slide back into a reserve role as the first safety in off the bench. But Green Bay should be encouraged that the two mistakes by Clinton-Dix were immediately corrected. Throughout training camp, second-round pick wide receiver Davante Adams has rarely been a part of the punt return unit. Most often it’s been Micah Hyde, Randall Cobb, Myles White and Tramon Williams. Yet, on the Packers’ first two opportunities to return a punt, there was Adams. Unfortunately for Adams, this may have been his last chance at becoming Green Bay’s punt returner this season. He muffed the first one but was able to scoop the ball up and run for eight yards. However, Adams dropped the next one, too, this time with Tennessee recovering at the 13-yard line and scoring on the first play of the ensuing drive. That was it on the day for Adams in that role, as Hyde took over from there. While the aforementioned weather conditions made it very challenging for any returner (as Hyde can attest after muffing — but quickly recovering — one of his own), it’s not always sunny and dry for a game. The Packers won’t want to give up on Adams catching punts forever, but with the regular season less than four weeks away, it’d be surprising if he was given many more chances for a while after his performance in Tennessee. The situation couldn’t have been any more challenging for JC Tretter, who started the game at center, a first for him in his football career. As the player who begins every offensive play by snapping the ball, Tretter had many chances to let the wet conditions affect his approach, but it didn’t. Tretter has worked with Flynn in practice, but the converted offensive tackle/guard has spent more time with Rodgers. That didn’t matter, though, as Tretter worked well with Flynn. The other four starting offensive linemen exited after the successful first drive, but Tretter stayed in for two more series. As the rain continued to pour, Tretter stayed steady. When rookie center Corey Linsley entered the game, his very first snap to Flynn was a botched exchange. This has been Tretter’s job to lose since Day 1 of training camp, and this was a great first test for him that went off without a glitch. After years of bad luck with injuries, the Packers did everything they can over the off-season to stem the tide. They looked at it from every angle, eventually brought in some new officials to fix it. New training techniques. New programs. GREEN BAY, Wis. — Last month, ESPN.com’s Kevin Seifert brought you the story of how GPS-based technology is being used in sports — including by more than a dozen NFL teams — to study injuries and aid in their prevention. Since then, one of the companies featured in the piece announced it has added the Green Bay Packers to its list of clients. On Friday, Catapult Sports, an Australian-based firm that compiles live data on athletic exertion, welcomed the Packers in a message it posted on its Twitter account. How, exactly, the Packers plan to use the company’s services — which among other things can measure an athlete’s level of exertion and use it to gauge if that player is at greater risk for an injury — is not immediately known. On Catapult’s website, Buffalo Bills strength coach Eric Ciano explained how he uses the data. A recent study by Football Outsiders that appeared on ESPN.com indicated the Packers were among the most injured teams in the NFL the past two seasons. McCarthy took that a step further when he said recently that in his eight seasons as head coach, he’s had only two truly healthy teams — the 13-3 team of 2007 and the 15-1 team of 2011. We know from listening to McCarthy talk after injuries have befallen his team year after year that he has long been willing to examine all aspects of his team’s training regimen. “You got to grade yourself on, did you hit the target of training your football team right through this new CBA schedule?” McCarthy told reporters last month at the NFL annual meetings. “And you look at injuries; you look at your outcome. I feel like I haven’t hit the target that I want to hit. So with that I’ll continue to change and adjust and emphasize the things I feel we need to do and that will be evident when they get back here in the offseason program. Sadly, none of that matters. It is 99% luck, and the Packers have been dealt more than their share of bad luck the past five seasons without a doubt. One week now, and they’ve lost both Jared Abbrederis and now Donny Barclay for the season with torn ACL’s. This is before any preseason games arrive. This is on the natural grass of the Packers own practice facility, Nitschke Field. In good weather. Barclay was injured blocking against undrafted rookie Adrian Hubbard. Hubbard tried the bull rush, and Barclay’s knee got caught in an awkward position. Last year, before a preseason game even arrived, the starting left tackle Bryan Bulaga tore his ACL, ending his season before it arrived. Both of these guys now need to be replaced after they started and played well last season. This year, Bulaga is back, so far, and Barclay was projected as the top backup at both LT and RT, as well as the top swingman at either LG or RG. His loss is not a season-killer like losing Rodgers, Matthews, or Nelson would be. But make no mistake about it, losing Barclay will hurt. •In the offseason, fourth-year linebacker Jamari Lattimore looked like a player who was ripe for more playing time. As training camp entered its second week, that may have come to fruition. Lattimore got more snaps with the starting defense in Monday night’s practice, which was heavily focused on red zone work, than he had in camp to date. Lattimore worked extensively at Brad Jones’ inside linebacker position. Jones did not take any team snaps during the second half of practice but did take part in the final period of practice. Coach Mike McCarthy said he did not have any injury information on Jones, so it was unclear whether Lattimore’s playing time was earned or the result of something wrong with Jones. Safety Morgan Burnett also followed the same pattern as Jones, but McCarthy did not have any injury information about him, either. •All the hype — if you can call it hype surrounding undrafted free agents — was about the signing of Alabama outside linebacker Adrian Hubbard, but the better prospect so far has been Toledo’s Jayrone Elliott. The rookie outside linebacker had a monster showing in the one-on-one period, winning all four of his turns. Rushing off the edge, he beat tackles Derek Sherrod and Bryan Bulaga and handled Don Barclay twice. He was credited with the victory over Bulaga because he appeared to get held on the play. After he whipped Sherrod, someone in the crowd yelled, “C’mon, Sherrod, you were a first-round pick.” Previously, Elliott had gone 1-1 in the drill during the first week of camp. •One of the best fights of camp took place during the one-on-one drill. After center JC Tretter blocked defensive end Luther Robinson, the two remained engaged and threw punches until guard T.J. Lang came flying in and the rest of the linemen encircled them. Mason Crosby was perfect on eight kicks — from 33, 38, 42, 44, 46, 48, 53 and 55 yards — to run his summer-long mark to 28-of-30. … Sixth-round cornerback Demetri Goodson had a rough practice, giving up three touchdowns (to receivers Alex Gillett, Kevin Dorsey and Gerrard Sheppard) and picking up a pass interference call while trying to cover tight end Ryan Taylor. … The first (and only) night practice of camp lasted two hours and 21 minutes. McCarthy said the practice was so crisp that it ended 10 minutes earlier than scheduled. “I thought the energy, the tempo, it was outstanding,” McCarthy said. •Tight end Colt Lyerla, who sustained a knee injury in Saturday’s Family Night practice, will miss “a couple weeks.” His agent, Vinnie Porter, said Monday night that Lyerla is not expected to need surgery but that his knee has significant swelling. •In other injury-related news, seventh-round receiver Jeff Janis was activated off the non-football illness list after missing the first week of camp because of shingles. He practiced in full pads but appeared to be limited. Running back Michael Hill did not practice after he sustained a concussion on Family Night. Others who did not practice were safety Tanner Miller (ankle), receiver Jared Abbrederis (knee), defensive tackle Letroy Guion (hamstring) and defensive end Jerel Worthy (back). Receiver Randall Cobb took a hard fall late in practice but returned after sitting out one short period. •The Packers’ next practice is Tuesday at noon local time. They will hold only one other open practice this week, on Wednesday at 11:45 a.m., in advance of Saturday’s preseason opener at Tennessee.